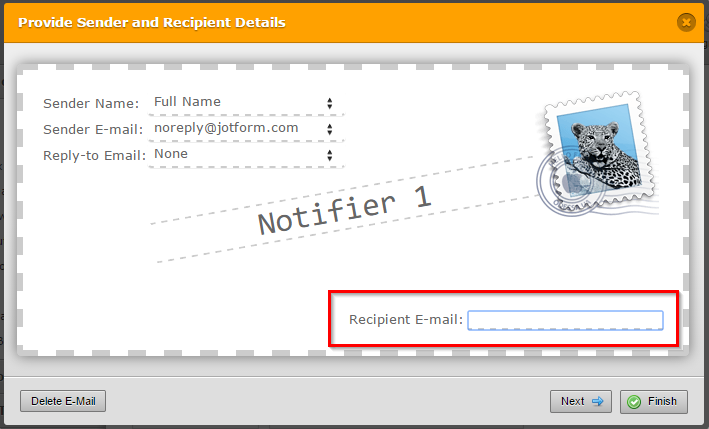 How to change the recipient in Email notification? Is it possible in this system to have email notification for a form go to an email listed after completing the form? 4. Click on Finish to save and close the wizard. Thank you, however that is not what I am asking. Is there a number to call to discuss the question?Kristen E. WamplerUnity of Indiana, CAOCell: 317-697-0140Office: 317-888-1481Fax: 317-888-1491Crisis Line: 800-234-4150kwampler@unityofindiana.comThe information in this E-mail message may contain legally privileged and confidential information intended only for the usage of the individual named above. If you, the reader of this message, are not the intended recipient, you are hereby notified that you should not further disseminate, distribute or forward this E-mail message. If you have received this E-mail in error please notify the sender immediately and delete the original. Unfortunately, we are not offering any telephone support at the moment. However, you can ask any of your questions here and your questions shall be answered in a timely manner. Please get back to us if you are referring to something different. We will be happy to help.